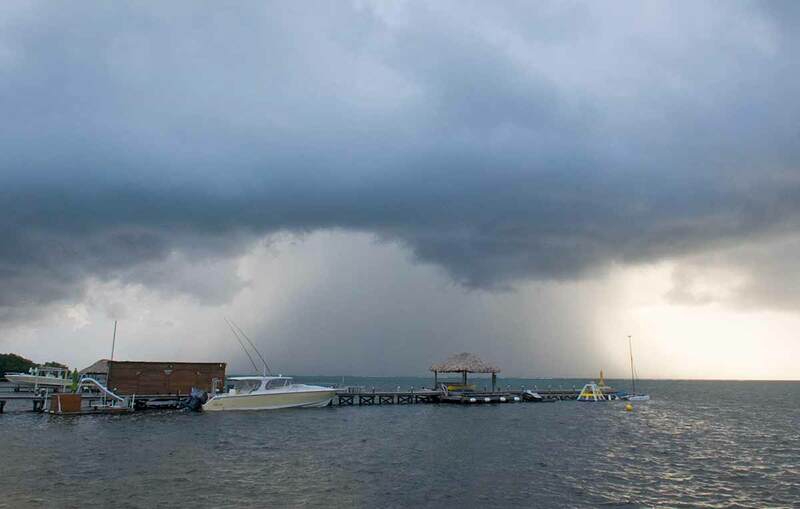 Belize NMS: Tropical wave in the area supports moist and unstable conditions. 24-hour forecast: Mostly cloudy with some showers, periods of rain and a few thunderstorms over most areas today then mainly along coastal areas tonight. General Outlook: Showers and thundestorms are expected to decrease with activity concentrated mainly in the north on Thursday and then mainly over the south on Thursday night. Today E 10-20 kts Moderate-Rough 4-7 ft SOME SHOWERS, THUNDERSTORMS AND PERIODS OF RAIN ESPECIALLY CENTRAL AND NORTH. Tonight E 10-20 kts Moderate-Rough 4-7 ft SOME SHOWERS, THUNDERSTORMS AND PERIODS OF RAIN. Tomorrow E 10-20 kts Moderate-Rough 4-7 ft A FEW SHOWERS AND THUNDERSTORMS, MAINLY NORTH AND DECREASING. Outlook E 10-20 kts Moderate-Rough 4-7 ft A FEW SHOWERS AND ISOLATED THUNDERSTORMS IN THE SOUTH, DECREASING. Two tropical waves are moving across the basin. Refer to the section above for details. A Gale Warning is also in effect. Please check the Special Features section above for details. 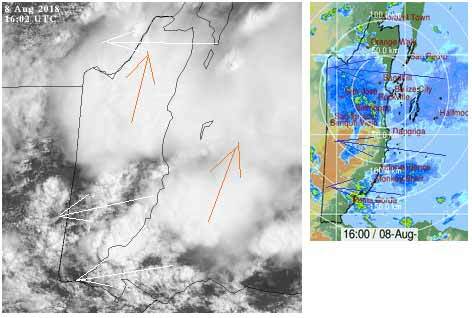 The monsoon trough in the SW Caribbean supports scattered moderate convection south of 13N and west of 80W. This pattern will continue through midweek. The next tropical wave is forecast to reach the waters E of the Lesser Antilles late Thu, and move across these islands on Fri.
On Ambergris Caye this morning the wind is from the East at 10 mph. The sea around our barrier reef is choppy. We have an overcast sky and rain. Today's expected high temperature is 85 f.
Rain, Rain, last night and today. There are many ITCZ flair-ups all over central and northern Belize and out in the sea this morning. The Caribbean cloud is still the chunky easterly, I think, but the high-level cloud is that earlier mid-level from the south, so clashing harder with the Caribbean clouds, producing a lot of rain. This has been happening all over our area for weeks, last night it was north west Yucatan, earlier it was Guatamala and Honduras, but often not on Belize, now it is our turn. 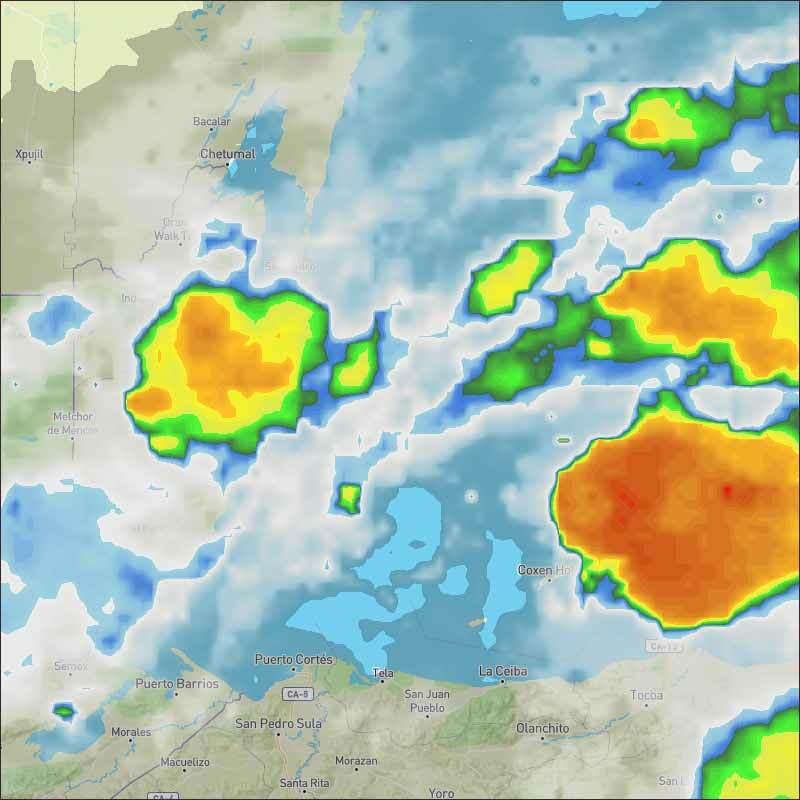 Looks like it could be an all day rains for central and northern Belize, not yet hit the south much, but it is coming soon.